In the recent blog post A pain in the… I described my summer holiday fun being a cycling tour round the Baltic coast. You meet a lot of data quality issues on such a tour. One experience was when we arrived in the Polish town Świnoujście. I planned the tour using Google Maps. According to the plan we would arrive in Świnoujście from the west, cross the bridge over the river Świna and reach the ferry to Sweden on the east bank close to the railway station. Nice plan. Only thing: Opposite to what’s shown on Google Maps – and told in the route planner, there is no bridge across the river in the real world. Fortunately there was a free ferry service across the river. So we did catch the once a day big ferry to Sweden in time. PS: The road name on the bridge on Google Maps is by the way Wodna. Wodna is Polish for (something with) water. Is the bridge shown on paper maps? Do GPS’s show the bridge? Is this another conspiracy on the part of Google to change the world by removing links between countries, changing borders and perhaps planting objects in their satellite views that do not really exist? Or does Google Maps represent a parallel universe? Be afraid, be very afraid. Google is slowly taking over our minds. Right Richard. I should have crosschecked with Wikipedia. 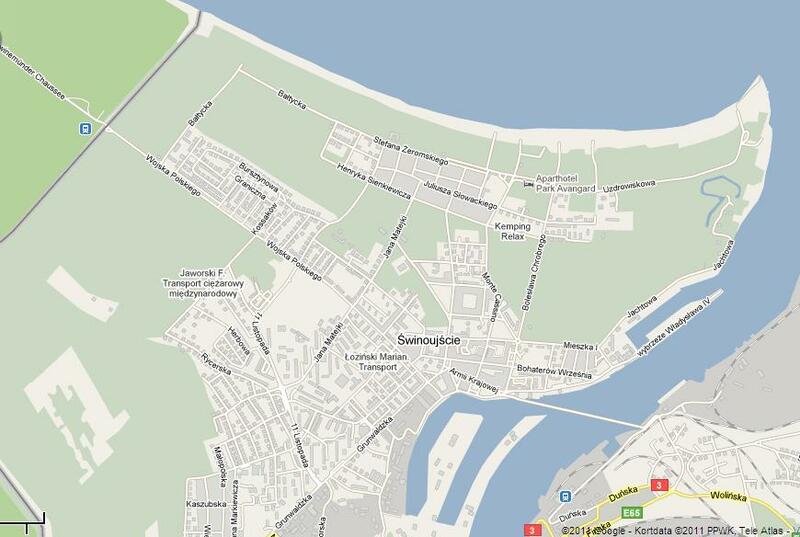 The article about Świnoujście shows a map without a bridge and says that a tunnel will be finished in 2013. Very interesting blog Henrik, Loved it. I guess, most of us would prefer Google acknowledging that they don’t know some of the things instead of making the maps look stupid. It will help both Google and millions of people who rely on these maps. Prashanta, thanks for joining. I’m sure Google is improving both the route planning algorithms and the reference data behind the maps and services all the time. What we sometimes see is a common circumstance with global reference data, which is that they reflect the different national reference data and sometimes makes mistakes in standardization. One explanation for the not existing bridge (or tunnel) could be a false translation of a ferry service. My understanding is that many map providers put a few false entries in their mapping (like seeds in a database) to understand who is copying their content. Perhaps you have just been unlucky in discovering one of these? Thanks Daryl, such seeds are really damaging when using external reference data for real world alignment. Great article, Henrik – gave me a good chuckle – keep up the good writing! Nice post..i have a take on data quality issues in maps..often it is man made due to differences in opinion between countries over disputed areas..no serious attempt is really made to resolve these issues..regarding quality of Google maps..in my view the accuracy varies from country to country..for instance in India i find quite a few errors at street level..this is partly due to poor quality digitized maps in the country..so part of the blame lies with the government agencies that create these maps..often errors are not corrected for years..Google does use local maps as a source which causes the quality issues to persist..